When a developer lols it is often off by one. kik! No seriously! Thanks! The issues I was having was me nuts, and at least I can rest easy that its not me! Well until the all fix goes out and I am still having an issue, but lets just be happy being content. Keep in the sunlight! There is a tight coupling between the user experience (UX) and the user interface (UI). They are often synonymous, I think they are nearly interchangeable in many aspects. Is it just me? But I find the following technologies to be very exciting. I am watching closely to see how the following 3D related technology *advancements* turn out (when they come out). If they do half of what they say they do they are still pretty cool to behold! Unlimited polygons! What if it wasn't about polygons anymore? I am keeping a tight watch on these blokes to see how they do! The narrator... well... we can talk about him later. He has quite the radio voice. Maybe it is that and a combo of the Aussie accent. I'll leave it at that. Just work through the narrator if he annoys you, its worth grokking what they are showing. Dwarf Fortress and mining carts oh my! Time to get your Friday nerd on! Here is a gaming oddity. 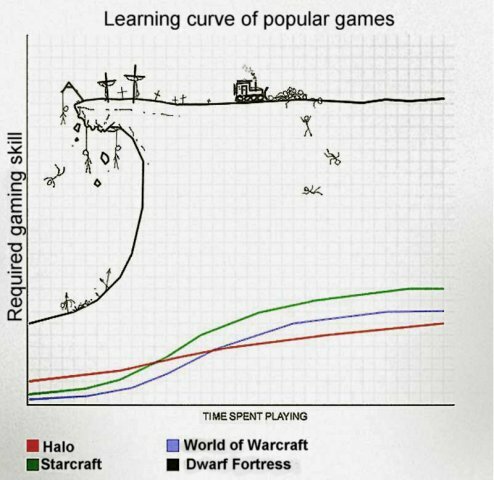 I didn't actually look into Dwarf Fortress (DF) till a few years ago. I was on a personal quest for some kind of time filling 'simple' RPG when a friend (Miccah Merrill) suggested I get over my hangup and try it. There was a new adventure mode (satisfying my desire for an RPG), but I never got that far! I'll try it someday along with Dungeon Crawl Stone Soup RPG... There is simply not enough time in the day. And the latest release notes said something about mining carts. OK now this I got to see! I agree with the source blog's title and the graph is rather accurate... I am glad and sad I waited this long in life to finally stop whining and get into this game/simulation/lifestyle. Bay12 Games (Tarn Adams and his brother) have been crowd sourcing this game for decades. They are the first kickstarter before kickstarting was cool since they operate solely on donations. Read this well written article by the NY Times for the full history. If you ever want to be bored to tears about my escapades in DF just ask! This event makes me look back and back into the future he envisioned for us all to have to come to terms with... and another author's voice suddenly comes to mind. I can not agree more. I think a Ray Bradbury quote is in order but I have not reflected enough on his life yet. RIP Ray Bradbury (August 22, 1920 – June 5, 2012). I tend to fiddle with my operating systems too much. Linux because I have too, Windows because I can, and Mac 'cause they said not to.